I am pretty sure my mother and I should have our own talk show called Pillo—I mean Patio Talk. I’ve never been good at building things with my hands–especially those Ikea shelves, dressers, and desks. Consistently, without fail, I will normally buy a structure to build, pull out all the pieces, place them nicely on the floor, and then run screaming for help. Fortunately, in college my roommates were often able to help me. 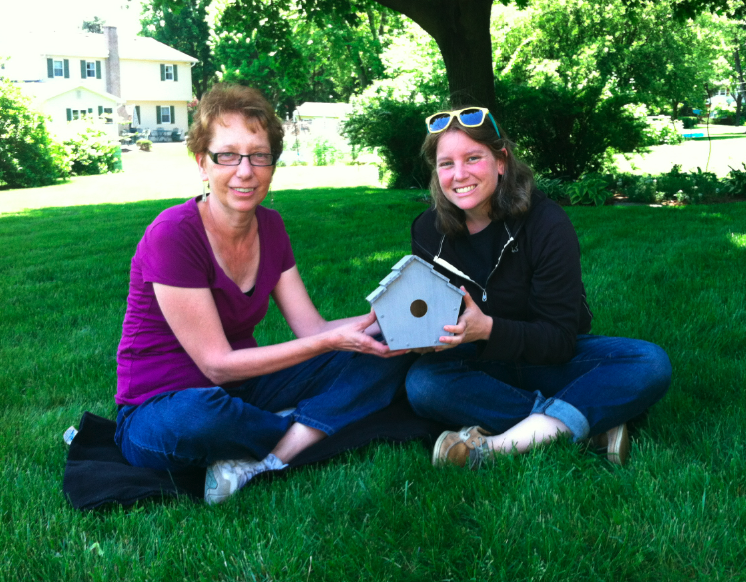 For building the birdhouse, it was just Mom and Me–the perfect Mother’s Day treat for her, and the perfect hobby of the week for me. What do you think? Should we have our own show? Posted in Do It Yourself, Happiness and tagged Bethlehem, birdhouse making, birds, construction, hands, ikea, leaves of green, Life, mom, mother's day, painting, patio, Patio talk with mom, Pennsylvania, Pillow talk with mom, screws, Simon and Garfunkel, struggles, talkshow, tweets, twitter. Bookmark the permalink.